Introducing the CIRRUS, the First OUTDOOR Shuffleboard on the Market! Boasting the Quality and Durability you’ll only find in a Hudson Shuffleboard, the Cirrus is Constructed entirely of Solid Hardwoods and Features a Fiberglass Coated Playfield and Cradle. Also included is our Sunbrella table cover. 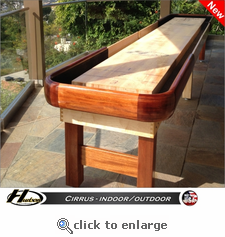 Now You Can Enjoy Playing Shuffleboard OUTDOORS on a Beautifully Designed CIRRUS Shuffleboard. Available Sizes are 9', 12', 14', 16', 18', 20', or 22' (tournament size).